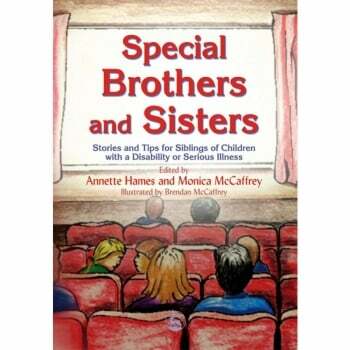 Stories and Tips for Siblings of Children with Special Needs, Disability or Serious Illness Author Edited by Annette Hames and Monica McCaffrey Publishing Date: 38579 Binding: paperback Special Brothers and Sisters is a collection of real-life accounts from the brothers and sisters of children with special needs, disability or serious illness, ranging in age from 3 to 18 years. They explain, in their own words, what its like to live with their siblings. There is a lot of advice available for parents of a child with a disability or illness, but very little about the important issue of educating their siblings about how they feel, and why they may behave differently from other children. These stories - from 40 different families - come with related tips to help siblings deal with some of the things that happen in their family lives. The book also provides a helpful glossary to explain, in child-friendly language, the disabilities and medical conditions mentioned, including: ADHD, autism, cerebral palsy, cystic fibrosis, Down syndrome. Special Brothers and Sisters is an engaging and educational collection that will enable young people and adults to share in the extraordinary experience of being a sibling of a child with special needs, a disability or serious illness.